... Amazon haven't actually been in touch with me to ask if I would like them to sell such a subscription or to suggest a revenue share. The fact that this product is 10,649th in their chart indicates that they have indeed sold some subscriptions. So what they are doing is selling my content on their site without any permission at all - and then trousering 100% of the revenue. Some might call that intellectual property theft. It's virtually impossible to contact Amazon by phone. So perhaps they'd like to contact me and explain how they are selling my product without my permission. Otherwise they might be hearing from m'learned friend. UPDATE 17/8: All sorted. It appears that Newstex, a company which supplies my blog feed to Lexis Nexis, also supplies the feed to Amazon. I hadn't known about this. Amazon have been in touch today and in future I'll be supplying the feed directly. From what I understand, this is their form of an RSS reader. The charge is that of delivery to the device via 3G rather than for the content. I'm fairly sure that they make no money from it. If they do of course then you're well within your rights to protest, and if you wanted to pull your content then they'd have to accept. Otherwise if they're just providing a RSS-to-device service, it's no worse than a mobile RSS reader that costs to download the first time. Or a mobile network charging data usage to view your site. I understand why you'd be miffed on first seeing it though, I think I probably would have been! I suspect that they have a deal with Blogger and that you have waived your IP rights to Blogger. You should have a read of the T&Cs of your blog. Still, they give Shane's blog out for free, so you should take comfort in that. Amazon may argue that the charge is purely for the delivery of content but the variable pricing suggests that this is part of a business model. Also, I don't believe Blogger/Google claims any intellectual property rights. It just provides the web space. The terms and conditions say "Google claims no ownership or control over any Content submitted, posted or displayed by you on or through Google services. You or a third-party licensor, as appropriate, retain all patent, trademark and copyright to any Content you submit, post or display on or through Google services and you are responsible for protecting those rights, as appropriate." All sounds very curious. I'd be very interested to know what's going on here. As for Guido, I do get the impression these days is that money is all he cares about. As others have said you are hosting on a third party - not sure what the blogger T&C are but you might not have any recourse. You could always put in some code (or get someone else to do that) - if the blogger platform lets you - that sniffs the kindle's user agent string then sends them something else rather than your blog content. 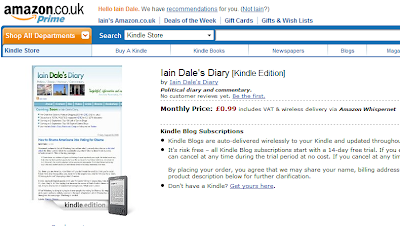 I don't think there is a blog platform that Kindle cannot publish from. But I think the only way to stop them "re-publishing" the content is to turn off RSS altogether, which disables people using normal free RSS readers, or maybe just publish snippets, which can be done with blogger. They can't send data to a device without an RSS feed, cause they won't scrape the content from the page. The price difference I think is that they charge double for Guido because they can, but the subscriber with the device is really paying a flat monthly price for a certain amount of data, not the quality or contents of it. But why would anyone pay money to read it when you can get it for free? 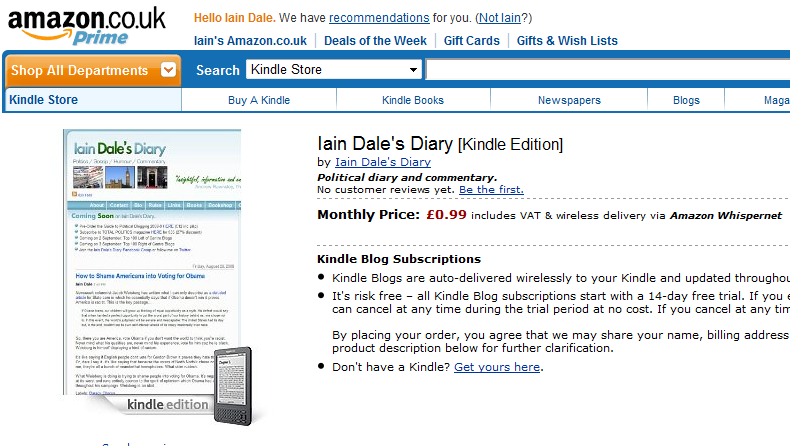 In fact, I've discovered that Amazon may not be making any money off this, but some other person could be. Anyone can add an RSS feed to the Kindle store and take a cut of the money, even if the blog had nothing to do with them? I think you can email amazon to get them to remove the feed. Fascinating. Having done a bit of digging, I have found a possible justification - if you prefer moon logic to the real thing. Apparently, if you own a Kindle, you can send HTML pages and word documents to Amazon, who will convert it into the proprietary kindle format at 15 cents per document. Now, arguably, a monthly subscription fee of around £1 or £2 per month is a far cheaper way of going about things for a blog that updates regularly than paying a flat rate per converted page. Because, of course, Kindles charge per document downloaded rather than charging a flat rate per month. On the other hand, (I am cursed with the ability to see all sides of an argument) consider the business model for a moment. Internet service providers charge for Internet access. How different, arguably, is that from charging for access to a single blog? If that genuinely reflects cost of transmission? Surely, for instance, a mobile phone provider that charges per megabyte to download a website is, in principle, charging for access to the content just as surely as if it had marketing the product as a specific product. playing Devil's Advocate for a moment, why shouldn't they charge? My ISP charges me to access your content, yet you don't see a penny of that. I access if, for convenience, via as RSS reader, so your advertisers get no benefit either, until or unless I 'click through' to the blog. If you are happy enough with that model, what exactly is so different about this one? Sure, it has something specific about your blog, but at the end of it all you are still prepared to make your blog free to view - you aren't expecting any direct financial return from folks viewing it (even if you may generate a small one from advertising etc. ), so why get upset about it? You're in the same position you were, and in which you were happy, regardless of what somebody else is doing. Best way trough is to post a series of blogs about Amazon, not defamatory but skirting the line, if they are simple retransmitting then they go out, or better still contact Sony and Apple to run ads for the Ipad and the Sony reader. OMG - Just the other day, I was wondering what the Trotter boys would be getting up to in this new age of technology. This strikes me as yet another variant of their infamous "Peckham Spring Water" scam. Next thing you know they will be taking pictures of your house and putting them on the web for all to see. I suggest you keep a sharp eye out for a Reliant Robin with a video camera mounted on the roof coming to your neighbourhood soon. I also suspect only Amazon.uk rather than .com will understand this. Since a blog is meant to be personal just turn it off! And £1.99 a month for Politicalbetting! I think it comes from a Newstex syndication deal which I assume you signed up to as well some time back. I'd gladly pay for your content, Iain. But you (or somebody else) would have to pay me to get me to read Guido! Can the system be reversed, so that Guido has to pay me to read him? The way to deal with it is to add something to your about page that says the blog is free for use with web browsers but charge $1.99 for downloading it for use on a Kindle. They won't bother reading your terms and will be breaking them everytime they download your content. Then you get to write them a nice legal letter and ask for your money. Note: this comment is copyright (c) 2010 nonny mouse, all rights reserved. Permission is granted to read this comment via web browsers free of charge. Download rights for this comment on Amazon Kindle is available for $9.99 per download. Can you claim a commission from Kindle? Fascinating issue and interesting responses! If you want a phone number for the customer service team Iain, it's 0800 496 1081. Is There Life in the Political Memoir? Any Questions for 'Any Questions'? Are You a Speechwriter or Speechmaker? Guardian Reports Old News Shock! Kevin Maguire: Labour Activists Are "Cretins"
The Worst MP of the 2010 Intake? David Milibrother Says "Ladies! Tidy Your House!" Farage Will Run "If I'm Fit & Well Enough"
Do You Know of New MPs Who Have Blogs? Fancy a Bit of How's Your Father on the State? Would 38 Degrees Like To Apologise? Vince: Coalition a "Business, not a Marriage"